In 2010, when Dark Horse launched the One for One program, making the first issue of select titles available for the low cover price of $1, the response was overwhelmingly positive from fans and retailers alike. Now, Dark Horse is making two of the biggest launches of 2012 available for less than the price of a cup of coffee! Brian Wood’s postapocalyptic, eco-conscious epic The Massive has been a critics’ darling since before the first issue even hit stands. The thought-provoking series has garnered consistent praise issue after issue, and will see its first collection released on March 20, 2013. 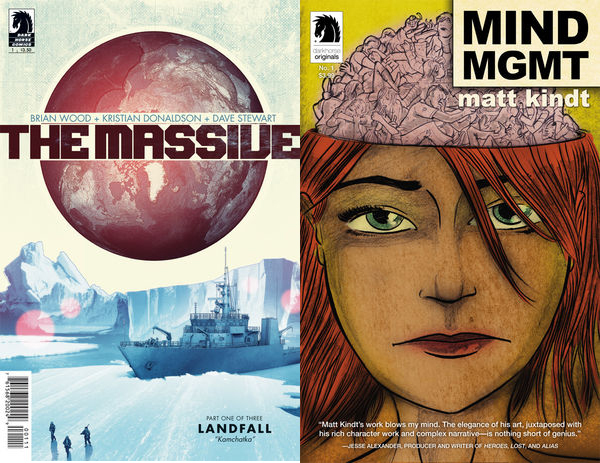 Similarly, MIND MGMT, Matt Kindt’s electrifying tale of psychic spies and the journalist who stumbles upon their incredible secrets, is expected to make many critics’ top-ten lists for the year. The first collection is making its way to comic shops on April 3, 2013. To celebrate, Dark Horse has decided to offer retailers and fans an opportunity to find out what they have been missing with two specially priced first-issue reprints, to be released on April 3, 2013! The Massive #1 will feature an all-new cover designed by series creator Brian Wood, while MIND MGMT will feature a brand-new cover by Matt Kindt! Look for these special reprints in Diamond’s Previews catalog on January 30, 2013.